TIF: A 300 dpi tif is the recommended format for photo images. This format is "lossless" which means that when you save it, all the information in the photograph is kept. JPG: Not recommended, but can be used. This is the typical format of digital cameras, as well as the web. This format is "lossy", which means that to compress the file size of the photo, the quality gets lower every time you save in this format, regardless of the DPI that you have set. Most typically, jpgs are low resolution (72 DPI). EPS: Logos and "line art" are best when saved in a vector format such as .eps or .ai. For details, read What are Vector and Raster Graphics.pdf. When you place the images in a page layout program (such as Indesign or Publisher), make sure that they are linked, not embedded. Embedded graphics result in huge PDF files that are sometimes impossible to process correctly. If you are using Microsoft Word or similar programs, your photo will be embedded. You will need to check your settings to ensure image compression is off before placing images, and when exporting to a PDF. Website Images: Photo files taken from web pages are low resolution (usually 72 dpi), which is fine for screen display, but far below acceptable quality for printing. Also, these images are usually under copyright, and therefore, not available for you to use. Online Stock Photos: Professional photo files can be found at many stock image companies online. Digital Camera: Most digital cameras take large-dimension 72 dpi JPG photo files. Using Photoshop, their dimensions can be reduced while the dpi is increased to 300. They can then be saved as tif files. Scanning: Make sure to set the resolution at 300 dpi for photographs, 600 dpi for line drawings (images with only solid black, such as logos). 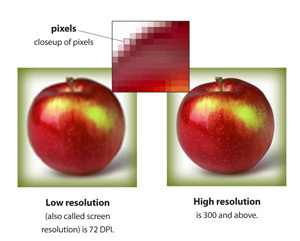 You cannot "fix" the resolution of an image by simply raising the number of pixels in Photoshop, the photo must be originally obtained at a high quality from the start. Image mode for color printing: Either CMYK or RGB can be used. RGB will print richer colors, but your monitor will no give a proper to view to how these colors will look when printed. For more information, check out color management. For best quality, scan as RGB rather than grayscale, then convert to grayscale in Photoshop. "Optimize" your photos by adjusting the darkest and lightest parts of the image (using Levels) so it has good tonality. Scanning images from newspapers, magazines or books will give marginal results, and can result in a moire--a pattern of dots across the image. To avoid a moire, scan previously-printed photos at a 30 degree angle. Do not scan from previously-printed photos if they are copyrighted. Avoid excessive enlargements (over 300%) that compromise detail. If you must enlarge your photograph, set your resolution to 230 dpi x % of enlargement. If you have concerns about color, please review our color management guidelines.